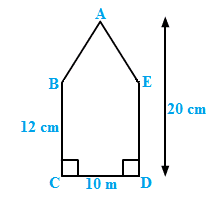 Find the altitude of a triangle whose area is 42 cm2 and base is 12 cm. 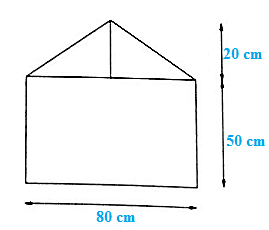 The area of a triangle is 50 cm2. If the altitude is 8 cm, what is its base? Find the area of a right angled triangle whose sides containing the right angle are of lengths 20.8 m and 14.7 m.
The sides containing the right angles are of lengths 20.8 m and 14.7 m.
Let the base be 20.8 m and the height be 141 m.
The area of a triangle, whose base and the corresponding altitude are 15 cm and 7 cm, is equal to area of a right triangle whose one of the sides containing the right angle is 10.5 cm. Find the other side of this triangle. It is given that the area of the first triangle and the second triangle are equal. Hence, the other side of the second triangle will be 10 cm. 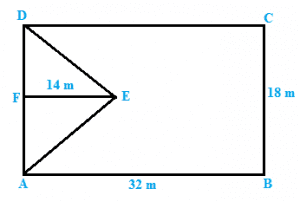 A rectangular field is 48 m long and 20 m wide. How many right triangular flower beds, whose sides containing the right angle measure 12 m and 5 m can be laid in this field? In Figure, ABCD is a quadrilateral in which diagonal AC = 84 cm; DL ⊥AC, BM ⊥ AC, DL = 16.5 cm and BM = 12 cm. Find the area of quadrilateral ABCD. Find the area of the quadrilateral ABCD given in Figure. The diagonals AC and BD measure 48 m and 32 m respectively and are perpendicular to each other. In Fig below, ABCD is a rectangle with dimensions 32 m by 18 m. ADE is a triangle such that EF⊥ AD and EF= 14 cm. Calculate the area of the shaded region. In Fig. below, ABCD is a rectangle of length AB = 40 cm and breadth BC = 25 cm. 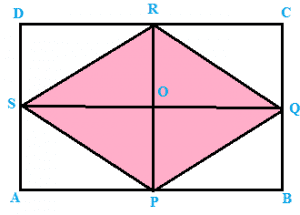 If P, Q, R, S be the mid-points of the sides AB, BC, CD and DA respectively, find the area of the shaded region. Join points PR and SQ. These two lines bisect each other at point 0. Calculate the area of the quadrilateral ABCD as shown in Figure, given that BD = 42 cm, AC = 28 cm, OD = 12 cm and AC ⊥ BO. Find the area of a figure formed by a square of side 8 cm and an isosceles triangle with base as one side of the square and perimeter as 18 cm. Let x cm be one of the equal sides of an isosceles triangle. (i) P is the midpoint of AD. Calculate the area of quadrilateral field ABCD as shown in Figure, by dividing it into a rectangle and a triangle. Join CE , which intersect AD at point E.
Calculate the area of the pentagon ABCDE, where AB = AE and with dimensions as shown in Figure. The base of a triangular field is three times its altitude. If the cost of cultivating the field at Rs 24.60 per hectare is Rs 332.10, find its base and height. Then base of the triangular field is 3h m.
The rate of cultivating the field is Rs 24.60 per hectare. A wall is 4.5 m long and 3 m high. It has two equal windows, each having form and dimensions as shown in Figure. below. Find the cost of painting the wall (leaving windows) at the rate of Rs 15 per m2.